My new favorite sweet pepper to grow at home is the hybrid Italian variety, 'Giant Marconi' (Capsicum annuum 'Giant Marconi'). It's one of the largest of the Italian sweet peppers and has an oblong profile with a slightly lobed stem end. The fruits reach 6-8 inches or more in length. The bushy, upright plants grow to a height of 24-36 inches and should be spaced about 24-36 inches apart. These peppers also make great container plants. After all danger of frost has passed, I plant one or two of them in large containers and enjoy an abundance of the peppers all season long. Like most pepper plants, this one prefers a full sun exposure with a minimum of six hours of direct sunlight a day. It has average water needs but seems to tolerate some drought. It is also humidity tolerant. The plants do need excellent drainage if grown in containers because sweet peppers are particularly vulnerable to water stress if their pots do not drain adequately. A pot with several large, unobstructed drainage holes is a necessity in order to grow these peppers successfully. The peppers themselves are sweet and mild with a heat rating of 1-1000 Scoville Units. The fruits start out dark green, change to red, and then mature to a solid bright red. Maturation is 62-80 days. They can be eaten at any stage but are the sweetest when fully red. If you keep the peppers picked, the plants will continue producing until frost. 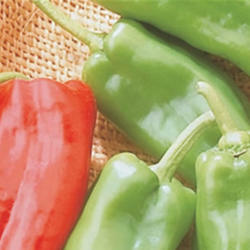 For optimal growth, the ideal pH range for peppers is 6.0 to 6.8, but peppers generally tolerate soil pH as low as 5.5. It's best not to fertilize pepper plants the first few weeks after transplanting in order to avoid an overabundance of green growth and very little fruit production. Once fertilizing begins, I use an organic 5-10-10 fertilizer. The 'Giant Marconi' variety of pepper was awarded All-America Selections recognition in 2001 for its "adaptability, earliness, smoky-sweet flavor, and yield." The plant is reported to be resistant to tobacco mosaic virus and potato Y virus. Some good ways to use 'Giant Marconi' peppers are: fresh in salads or salsa, fried, roasted, and dried. They are good in a wide variety of cooked dishes as well as in sandwiches, and they can simply be eaten alone. Freshly picked from the bush is one of my favorite ways to enjoy them. Because of its size, this pepper is also ideal for stuffing and grilling. Mix the cheddar cheese into the cream cheese. Fill the hollow peppers with the cheese mixture and grill for approximately 5-10 minutes.